An Auger Filling & Packaging Line was recently commissioned to package a range of mineral and vitamin powders in New South Wales. 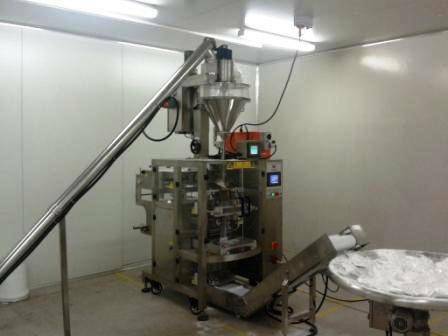 Supplied by Accuweigh’s Newcastle branch, the Auger Filling & Packaging Line comprises an auger filling machine feeding into a Vertical, Fork, Fill & Seal machine. The Automatic Auger Filling & Packaging Line was custom engineered to provide a product throughput of up to 35 bags per minute with a filling accuracy down to 0.5%. An AccuPak Auger Conveyor and inlet hopper manufactured in full 304 stainless steel transfers powdery products to the auger filler. The reversible, dismountable auger and discharge gate ensure easy cleaning while the product hopper can also be separated for easy assembly. Accuweigh’s Auger Filling & Packaging Line includes a VFFS packaging machine designed to produce pillow bags with a centre longitudinal seal from flat roll stock film. This machine is also constructed from 304 stainless steel and features servo-driven film transport system and intermittent motion end seal jaws, PLC and touch screen operator interface. A supplied output conveyor receives filled bags from the VFFS bag machine and conveys them using a 200mm cleated conveyor belt with adjustable belt speed to a rotary pack-off turntable. All product installation costs, commissioning and training were included in the purchase price to prevent unexpected charges to the client. Accuweigh/Budpak has extensive industry experience in all weighing, filling, packaging and palletising applications and provides Superior Product Support through eight branches across Australia for all Auger Filling & Packaging Lines.